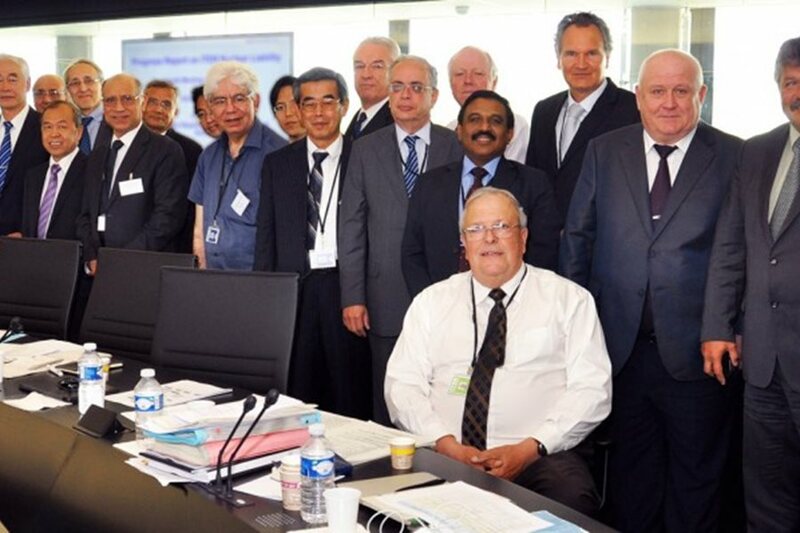 The fourteenth meeting of the ITER Council concluded on Thursday, 19 June, after two days of deliberation and discussion. Hosted by the ITER Organization in its Headquarters building in Saint Paul-lez-Durance, France, the meeting brought together representatives from the seven ITER Members: China, the European Union, India, Japan, Korea, Russia and the United States. Under the chairmanship of Robert Iotti (US), the Council reviewed the progress of ITER construction and manufacturing. 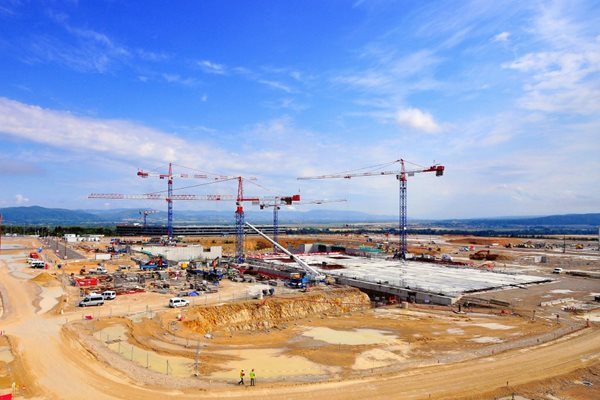 The ITER Organization reported on the arrival of components and the Council agreed on necessary changes to meet the challenges of construction and assembly. The Members discussed the current status of their activities and procurements as well as the need to finalize an updated schedule. Click here to view the photo gallery of the Fourteenth ITER Council. Read the Press Release in English and in French. Arnaud Devred, head of the ITER Superconductor Systems & Auxiliaries Section, has been selected to receive this year's Institute of Electrical and Electronic Engineers IEEE Award for Significant and Sustained Contributions in the field of Applied Superconductivity for his 'many and significant contributions to the field of large scale applications.' The award recognizes researchers and technologists who have made "contributions in the field of applied superconductivity over a period of time of more than twenty years based on novel and innovative concepts proposed by the individual, the authorship or co-authorship of a number of publications of significance in the field of applied superconductivity and the presentation of a number of plenary and invited talks at major national and international conferences and meetings in applied superconductivity, including the Applied Superconductivity Conference," it says in the recipient's letter signed by Martin Nisenoff, chair of the Awards Committee. Previous recipients in the field of large-scale applications of superconductivity include: Henri Desportes, the late Hironi Hirabayashi, Yukikazu Iwasa, Peter Komarek, Daniel Leroy, Alfred D. McInturff, Joseph V. Minervini, D. Bruce Montgomery, Romeo Perin, the late John Purcell, Lucio Rossi, William B. Sampson, the late John Stekly, Herman H. J. ten Kate, Alvin Tollestrup, Bernard Turck, Martin N. Wilson and Akira Yamamoto. Throughout his carrier, Arnaud worked for large international projects—some successful, like the Large Hadron Collider (LHC) at CERN, some less successful, like the Superconducting Super Collider (SSC) where he started his career in the project's Central Design Group based in Berkeley, California, US. Despite its cancellation, the SSC experience permitted him to meet Maury Tigner and John Peoples, 'two remarkable physicists who became my mentors and inspiration,' Arnaud recalls. 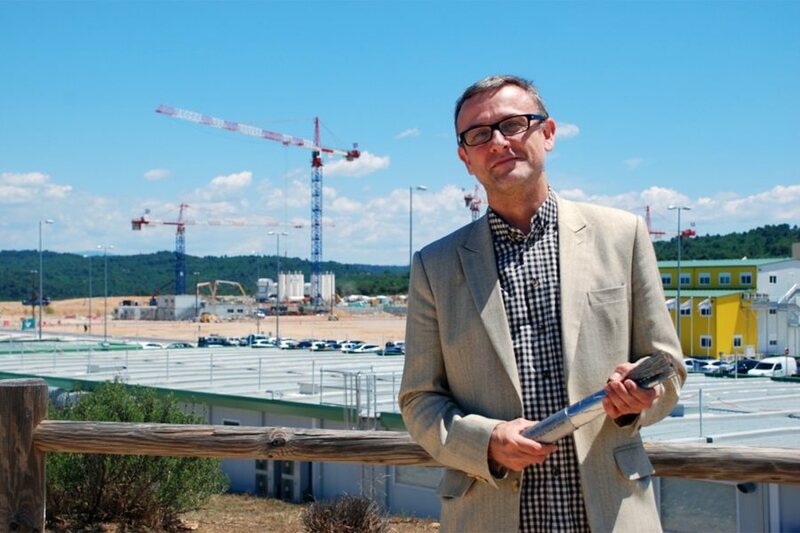 On 1 August 2007 Arnaud joined the ITER Organization, taking over a job which has been 'the most challenging in his life.' Looking back over the past seven years he recalls many crises, but "most of them were eventually resolved at the technical level, through sometimes long and protracted negotiations with the Domestic Agencies and/or with the help of external experts.' A particularly difficult problem arose when the team observed electromagnetic and thermal cycling degradation on early conductor samples for the central solenoid, which led to a crash program supported by extensive analyses and frontier imaging techniques. 'The program was successful and a straightforward industrialization solution was found and implemented that will ensure stable performance of the central solenoid coil with a suitable operating margin.' Another challenge for Arnaud and his team was the fact that in the pre-ITER world, the production of superconducting niobium-tin (Nb3Sn) strands was only 15 tonnes/year approximately, while ITER's magnets would require ~650 tonnes. The ITER Organization oversaw a ramp-up of world production to 100 tonnes/year over the last four years and the successful entry into the market of three new suppliers in China, Korea and Russia. Conductor production is now well underway: Nb3Sn strand production for the toroidal field coils (~500 tonnes) is nearly finished, toroidal field conductor production is two-thirds complete and all other production is in the series phase. In total, more than 100 conductor unit lengths have been completed, well ahead of coil winding, thereby requiring the setup of dedicated storage facilities. 'I would like to share this prize with my colleagues here at the ITER Organization and in the Domestic Agencies, as I believe it is our collaborative work that is rewarded with this prize. In my understanding, it is a recognition that—in spite of all the ITER constraints and difficulties—there is always a way to move forward and succeed.' The prestigious award—a medallion made of niobium—will be presented to Arnaud in a special ceremony on 10 August during the Applied Superconductivity Conference held in Charlotte, North Carolina, US. The Chinese Institute of Plasma Physics (ASIPP) has successfully accomplished a full-scale qualification prototype for one of the key components of ITER's magnet feeder system—the vacuum vessel that will provide thermal insulation to the components at the very end of the feeders inside of the Tokamak gallery. The ITER superconducting magnet system consists of 18 toroidal field coils, 6 poloidal field coils, a central solenoid (6 modules), 18 correction coils, and finally a coil supporting structure. 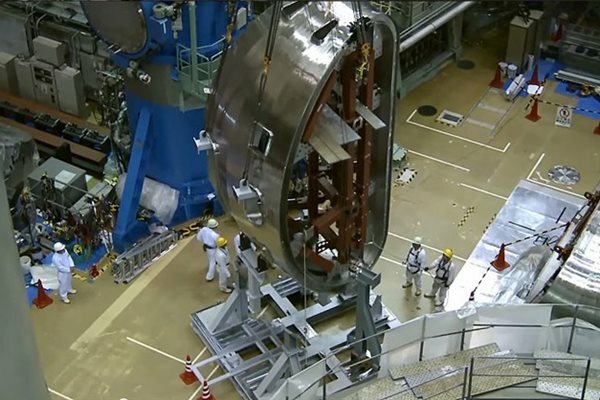 Leading away from the magnets, 31 superconducting magnet feeders will provide connections to the power supplies, the cryogenic plant, and the magnet control and safety units. Each feeder is made up of an in-cryostat feeder, a cryostat feed-through, and the coil terminal box/S-bend box (CTB/SBB) assembly. At the end of the feeders, within the Tokamak gallery, are the critical CTB/SBB boxes where electrical power and cryogens are relayed through the warm-cold barrier of the cryostat to ITER's powerful magnets that operate at currents from 10 kA to 68 kA. A protective vacuum vessel will provide thermal insulation for hundreds of encapsulated cryogenic components that are part of the boxes such as a 80K thermal shield, high temperature superconducting current leads, superconducting busbars, cryogenic coolant circuits with control/safety valves, cold sensors and signal cables, and cold mechanical supports (see diagram). 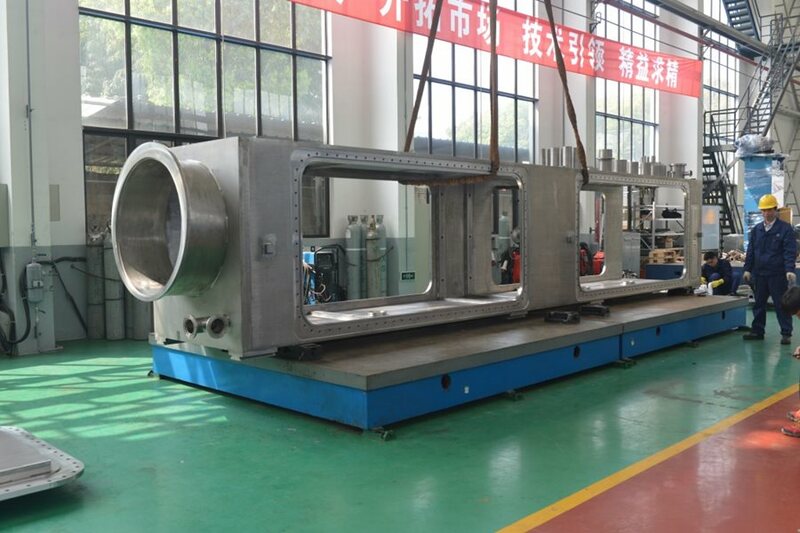 The CTB/SBB vacuum vessel is thus the largest (8m×1.3m×1.5m) and heaviest (18 t) feeder component. The final weight of a fully loaded CTB/SBB, vacuum vessel included, is 27 tonnes. 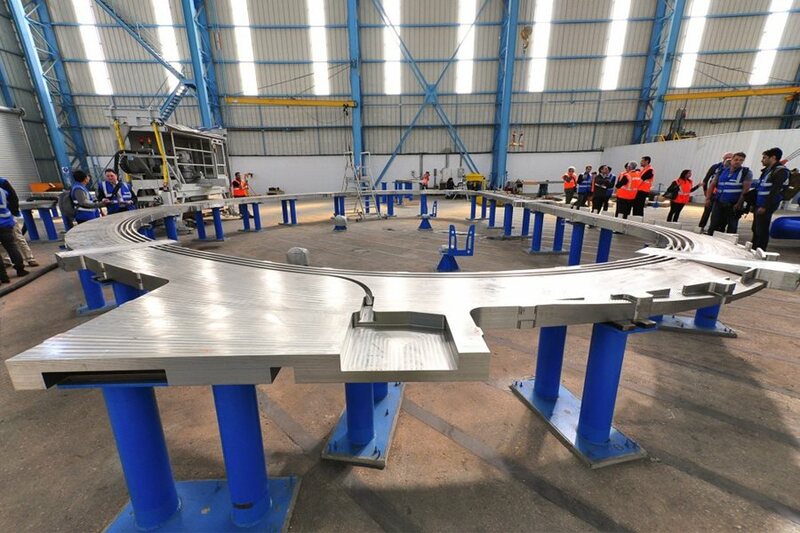 In order to meet ITER's stringent quality requirements, the Chinese manufacturer conducted a series of welding trials and assessments and submitted as many as 82 quality documents to the ITER Organization. A number of experts and certified third-party inspectors were invited by the ITER Organization to witness different stages of key welding processes as well as vacuum leak checking, non-destructive testing, and large component measurements. The successful realization of the full-scale qualification CTB/SBB vacuum vessel prototype is a significant accomplishment within the scope of the Magnet Feeder Procurement Arrangement. The experience gained in this prototype qualification has laid a solid foundation for the high quality series production ahead. The qualified component will now be used at ASIPP to provide the necessary vacuum environment for the downstream cryogenic qualification tests of the 80K thermal shield and the high temperature superconducting current lead prototypes, as well as the full-size mockups of the S-bend busbars with high voltage insulation. ​ Construction of the European Extremely Large Telescope has officially begun in the Atacama desert in Chile, marking the first step in a true mega-project that could offer us answers to some of the most profound questions in science. The event this week, the blasting of the top of Cerro Armazones — 3,000 metres high until Thursday, a few less now — was far less dramatic than many of the onlookers at the European Southern Observatory's Paranal facility 25 kilometres away had hoped for, but it was a significant first step in taking the E-ELT from the drawing board to reality. 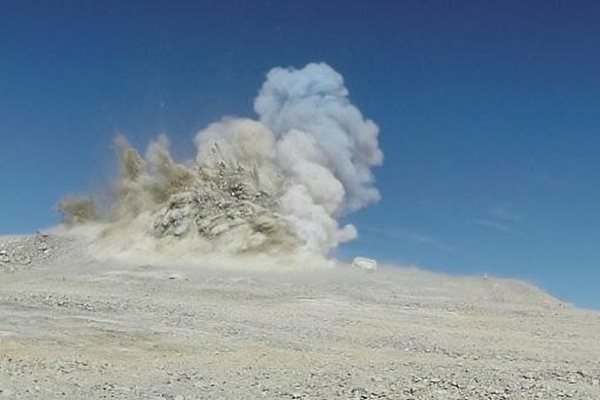 The function of the blast was to loosen many thousands of tons of rock from the summit in order for the earth movers to begin clearing a flat, circular area for the foundations of the telescope. This really is just the first small step in a massively ambitious project to build the E-ELT that will take at least a decade to finish. The science case for the E-ELT is quite easy to make, even to non-astronomers. While some of the great telescopes now in space and on the ground are designed to observe technical subjects such as the geometry of galaxies or the formation of stars, the E-ELT pitches itself as the telescope that will allow us to directly look at other planets around other stars. The E-ELT science team reckon they have a good chance of being the first to directly observe little blue dots like Earth, if they exist. Read more on Euronews website. ​The World Cup is an opportunity to take a look at how popular football games affect JET's experimental schedule: JET's peak power demand is over one percent of the UK supply — albeit for very short periods — so the supply from the grid is limited to 575 megawatts, and JET's two flywheels are used to top up if necessary. But at some times, JET is not allowed to take any power from the grid at all. 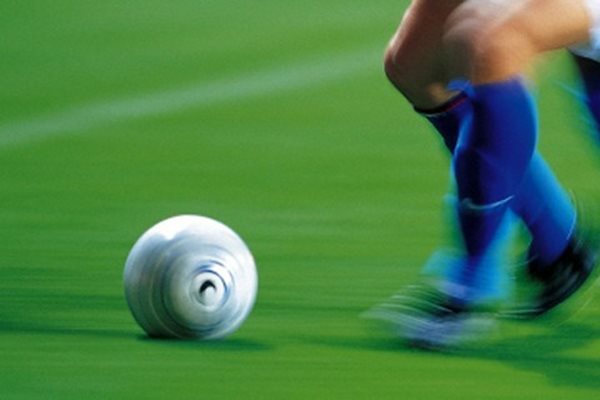 This happens when there are other major energy consuming events — such as halftime in a major football final, or in the ad-breaks in a popular TV show — times at which millions of people will switch on the kettle or go to the toilet, which creates an electrical load on the water pumping system. In fact JET power supply engineers are in regular contact with the grid, who advise every day the times at which pulses should be avoided — for example the fifteen to twenty minutes around sunset when lots of people turn on their lights. The engineers also monitor the frequency of the electricity supplied by the grid throughout the day: if the frequency falls much below the regulation 50 Hz they know the grid is under load and so they will recommend to the Engineer In Charge that pulses not be run. Read more on EFDA website. In​ this three-minute time-lapse video, nine years of Wendelstein 7-X assembly (2005 to 2014) are condensed into three-minutes. 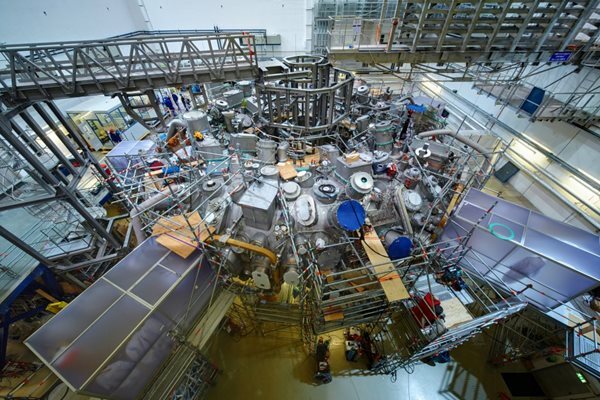 The fusion device at the Max Planck Institute for Plasma Physics, in Germany, comprises five large and almost identical modules that were pre-installed and then assembled in a circle in the experimentation hall. Pump-down of the machine began in May. Read more about Wendelstein 7-X on the IPP website. ​See the progress of the JT-60SA project — one of the three projects being developed under the Broader Approach Agreement — in this new clip filmed on-site in Naka, Japan. The clip shows that the six year assembly of JT-60SA is moving forward: the heart of the machine, the vacuum vessel, is now being built. Implemented by the Japan Atomic Energy Agency (JAEA) and the European Domestic Agency for ITER, F4E, the advanced superconducting JT-60SA (super advanced) tokamak will be used to quickly identify how to optimize plasma performance for ITER and will study advanced modes of plasma operation suitable for DEMO. A first plasma is foreseen for March 2019. You can watch the video here or read the news released on F4E's Media Corner. Има ли бъдеще слънчевата енергия за човечеството?